These limited edition noodle snacks are available in both grape and orange Fanta flavours, which sound like equally bizarre noodle flavours to me. I went for grape variety as I figured if nothing else at least purple noodles would look prettier than orange ones! 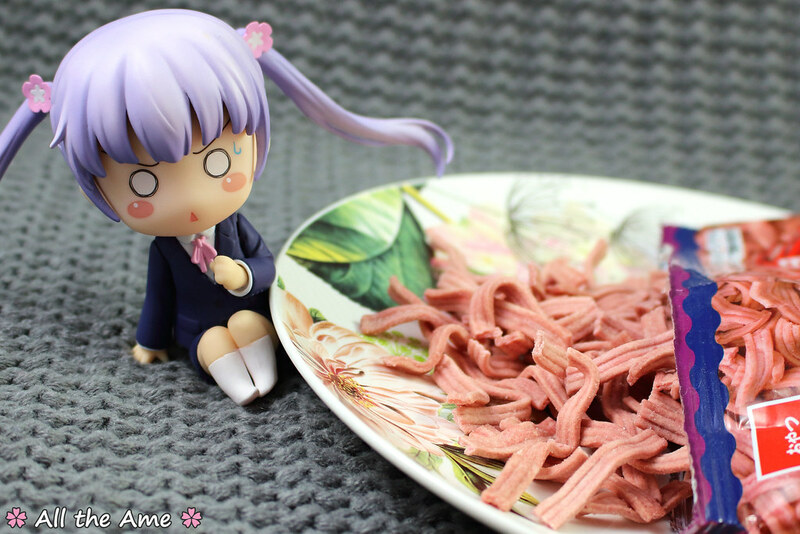 You have to admit, the wavy purple noodles really are pretty! Question being, do they taste as good as they look? 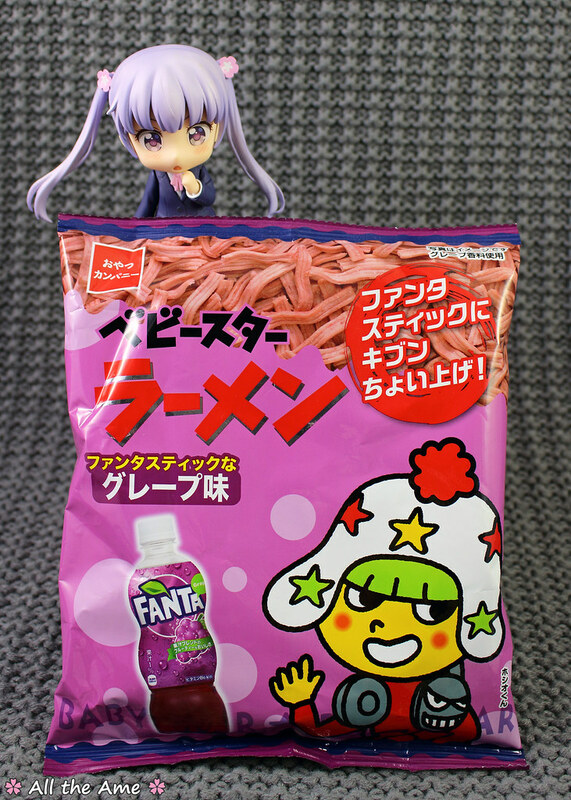 Fanta grape flavoured noodles probably fall under the category of snacks you buy because they’re bizarre and you want to try them, rather than snacks you buy because you think they’re going to be a culinary delight. That said these taste pretty good. Strange, but they’re a lot better than they smell! 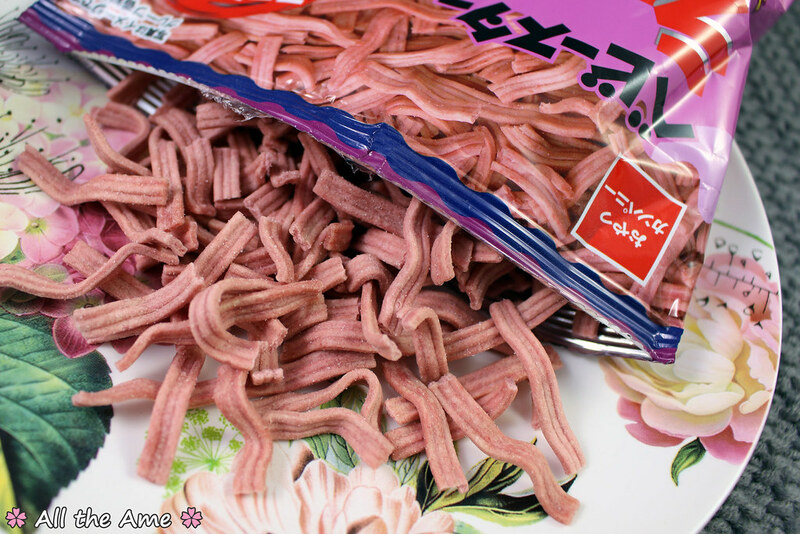 If you’ve tried any of the Baby Star noodle snacks before you’ll know that the noodles themselves don’t have all that much flavour, they simply act as a carrier for whatever is put on them, so making them grape flavoured isn’t quite as out there as you’d think. 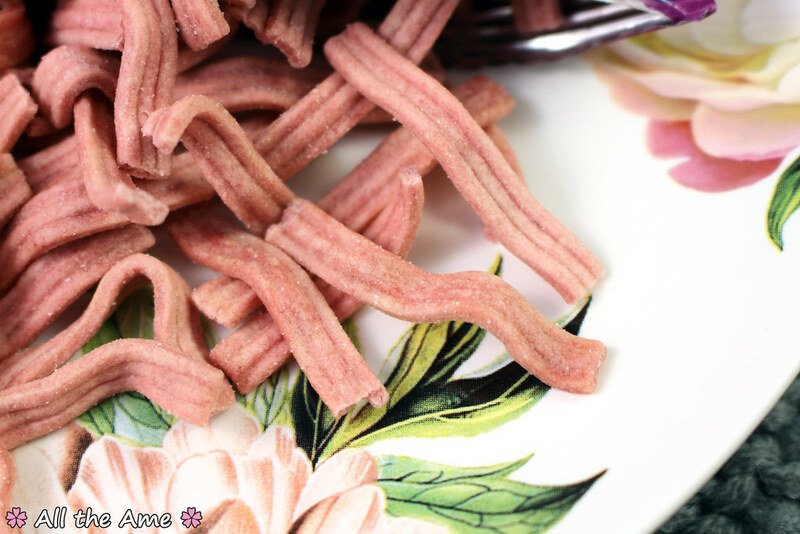 It’s not quite the same as putting grape candy in your bowl of noodles would be, more like putting grape candy flavouring on some baked unflavored dough. There’s no conflict or melding of flavours, it’s simply grape flavour and noodle texture. It’s a pretty interesting combination; the grape flavour is mild and sweet and nowhere near as artificial as it smells (just like grape Fanta really!) and works surprisingly well with the crunchy texture. They’re a lot tastier than I expected them to be! The weird factor for me comes from the menthol pieces and their cooling effect. 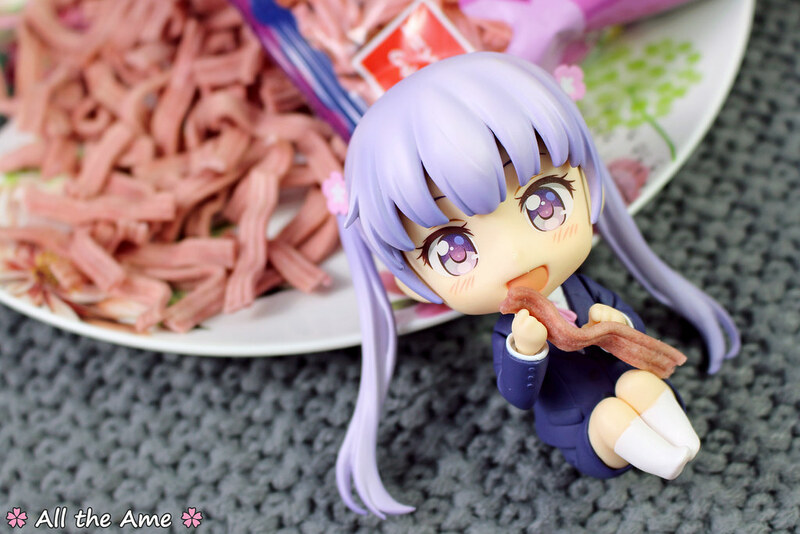 I’m thinking this is supposed to emphasise that you are in fact eating grape soda noodles, not mere grape noodles. You don’t taste menthol (thankfully) but you do get a fun cooling sensation at random intervals. Find too many of these cooling crystals in one mouthful and it does start to taste unpleasantly like you’re trying to eat candy after brushing your teeth, but for the most part it’s fine and actually quite refreshing. Like an ice cold can of grape Fanta? Well, not quite, but close! Overall rating: I’d give these an 8/10. They’re certainly unique, they’re a great novelty and once you add in the cooling effect it’s an entertaining experience. I’d definitely try the orange flavoured variety too, it’s a fun snack and a great example of how Japanese snack makers aren’t afraid to experiment with flavours, textures and extra effects. Would I buy them again? Probably not. After getting through this bag I can certainly say my curiosity regarding these weird and wonderful noodles snacks is well and truly satiated. I would buy the orange flavour though, and if they ever team up with the makers of ramune to make ramune flavoured Baby Star I’d buy those too! Would I recommend them? Sure, why not! As bizarre snack creations go you could do a lot worse taste wise. What do you think? Would you try these or have Baby-Star crossed the line into too bizarre?